Is Somebody Going to Control this Liquor Control Commission? I read an article the other day by Karl Klooster in the Oregon Wine Press titled "Taste of Trouble" and it took me back to my days of schlepping a wine bag in Oregon. My direct personal experience with the Oregon Liquor Control Commission (OLCC) involved getting a Service Permit. This allowed me to pour tiny tastes of wine without violating the law. However, through word-of-mouth, I heard many tales of sting operations and draconian enforcement. These rumors included tales of being suspended for not checking IDs at free public tastings and for drinking while on duty. The law doesn't allow for tasting, even if one is spitting, while working in the liquor business in Oregon. A friend and colleague was suspended for two weeks from pouring wine when he was "caught" tasting a wine he suspected of being corked. He tasted, spat and was busted by some agent of the OLCC for "drinking." Forced out of tastings for two weeks, his income dropped significantly because sales are driven by sampling, especially in Portland, Oregon. Fortunately, most consumers are aware of the intense level of oversight from the OLCC and eagerly hand over their ID in order to taste wine. This avoids the awkward moments I experienced in New Orleans, the land to the drive-through daiquiri shop, where people looked shocked when carded to taste an amount of wine with less alcohol than a bottle of cough syrup. Stage now set, let's return to Karl's tale. The OLCC sting operation of Torii Mor (an excellent winery and visit, by the way) featured a 26 year-old and a 19 year-old, both women. The server at the winery asked the younger one if she was 21. The employee should have known she wasn't, it was 2012 and the ID said the young lady was born in 1993, but I can testify that on a busy day or at a busy event, doing the math on legality of drinking age can be more challenging than it should be. This direct questioning is a fall back for many people serving alcohol in Oregon because if the person is an OLCC employee or agent, they are not allowed to lie during a sting operation. The underage woman replied, "You have seen my ID." Another query received the same response. There was no service of the underage would-be drinker but the 26 year-old texted an officer waiting outside. "She indicated that a 'sale' had taken place." The wine never crossed the counter from the winery employee's side of the bar and "[t]he preponderance of testimonial evidence indicated the minor never touched the wine glass." Charges were eventually dismissed but Torii Mor had the threat of revocation of their license hanging over them for more than six months and incurred legal fees. I understand the need to enforce the law and to occasionally show up to remind those serving that the OLCC is watching. However, this appears to be an instance of bureaucrats making something out of nothing to justify their existence. Congratulations on the dismissal Torii Mor! It's hard to forget these days, but always remember that Big Brother is watching and apparently looking for excuses to bust you. Courtesy of Shanken News Daily, I learned that Cedric Martin won Retailer of the Year from Market Watch. I congratulate my former boss but quibble with the wording in the report. "Martin, whose business was badly damaged by Hurricane Katrina in 2005, has since rebuilt and even expanded, emerging far stronger after Katrina’s devastation." Expansion has happened. Martin Wine Cellar did not have outposts in Mandeville or Baton Rouge before the storm, but they do now. There has been no rebuilding however. I wrote of the demolition in 2011 and was pleased to see ground breaking shortly after. No progress has been observed since. Cedric announced plans to have the original location (3827 Baronne St.) up and running in 2014 but I will believe it when I see it. Again, I applaud his award and tip my cap to his many successes but the uptown outpost they operate now is cramped and pales in comparison to the destination the old store used to be. I hope for his sake the store is rebuilt and revived. If that happens, this award should go to him. Until then, it appears premature. Other wine retailers have opened since Katrina and many are thriving, something nearly unfathomable when Martin's dominated the market. Mulderbosch was featured in Shanken News Daily recently. I am a fan of the winery, their chenin and sauvignon blancs and, especially, their fantastic chardonnay (I know, rare for me to rave about one of those). However, the plans to expand concern me. According to the Wine Spectator, Mulderbosch's total production when Mike Dobrovic left was 45,000 cases, "shipping 40 percent of its wares to the U.S. market." (That's 18,000 cases if you don't want to do the math.) That was 2009. Based on the numbers SND reports, U.S. sales are "expected to rise by more than 25% to above 40,000 cases this year, representing about a quarter of the winery's production." That is more than twofold in the U.S. and just under four times the total cases during Mike's tenure. It is always possible to expand like that and maintain quality but it is not easy. "The goal is to grow Mulberbosch to 150,000 cases in the U.S. market within five years." The previous goal may be attainable but this one is untenable, in my opinion. Not that they can't reach the number, I just believe they can not produce the same excellent wines at this volume. There was no discussion about sourcing grapes for this expansion but I would be amazed if they came from the estate. The wine world is a fantastic place to visit but I'm glad I don't live there anymore. The job of selling wine is an all consuming one. New wines are released all the time, new wines arrive in your portfolio, sometimes from regions unfamiliar and a new vintage arrives twice a year. * The work is mostly pleasurable and taking it home can be delicious but the world is insular and even casual acquaintances want to talk about wine. The insidious part, and the slippery slope, comes in the selling and recommending. I can't speak for everyone in the business but I sold wines that excited me...that I enjoyed. In advocating for these wines I became more enamored of them and bought my own product. Constant exposure to new vintages and new wines pressed my collector button too. Cult wines never did much for me. I did not accumulate museum pieces or investment bottles but my purchases of wines to drink piled up. My wish list extended far beyond that. While my wallet could mostly keep up with my purchases, there was a never-ending supply of wines coming that I "needed" to buy. Yes, needed. The rush associated with buying new wine fueled the desire for more and gradually the cheap stuff didn't satisfy like it used to. After getting out of the business I realized how expensive some of those wines had become, especially if you have to pay retail. Even that didn't quench my desire for those wines, just the rate at which I brought them home. Finally, after a few years out of the game, I appear to have shaken the monkey off my back. I still buy wine but it is mostly low end. I still drink wine but with less regularity than before. I still get offers for wine, among them Burgundy futures, but I no longer act on them. I no longer salivate and my heart no longer palpitates when the offers arrive. * Yes, twice a year. I'm not talking about release dates from various wineries but harvests. Vineyards in the southern hemisphere are harvested in our early spring while our growers pluck their grapes in the fall. 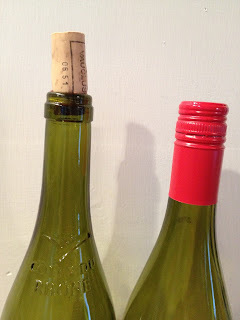 I tried another pair of cork/screwcap sealed wines. These have been written about before but updates seem important in this ongoing experiment. 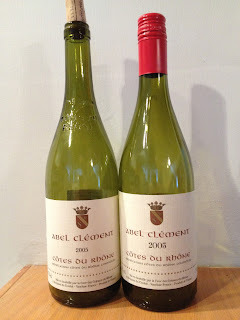 The Abel Clément Cotes du Rhone 2005 switched seals mid-vintage and afforded an opportunity to get as close to a perfect comparison of cork vs. screwcap as a consumer can get. As you can see, the labels differ slightly and the cork-finished bottle has a fancy Cotes du Rhone seal but the wines, as nearly as I could determine are exactly the same - other than the method of closure. These bottles are no longer fresh and pristine, showing older, dried fruits and some tiredness. They no longer have much snap on the palate but were certainly tasty enough for eight year-old Cotes du Rhone...especially when you consider I paid about $8 a bottle for them. In comparison, there was no contest. The screwcap bottle showed more vim and vigor than the cork version. They both had admirable staying power and offered enough fruit to make my mouth happy. The planned tasting last fall never came together but I'm hoping this fall works for a full tasting of all of my experimental collection. Stay tuned for details of the event and a full post, or two, discussing the results.